After you have installed Inbound Brew, simply follow these steps to create a custom email. To begin from the Inbound Brew navigation bar, click on “Email.” You can also access the email tool from the righthand side of your Dashboard. Click on the blue “New Email” button at the left to create a new email. From there, you can choose to create an entirely new, custom email or create an email from an existing template. 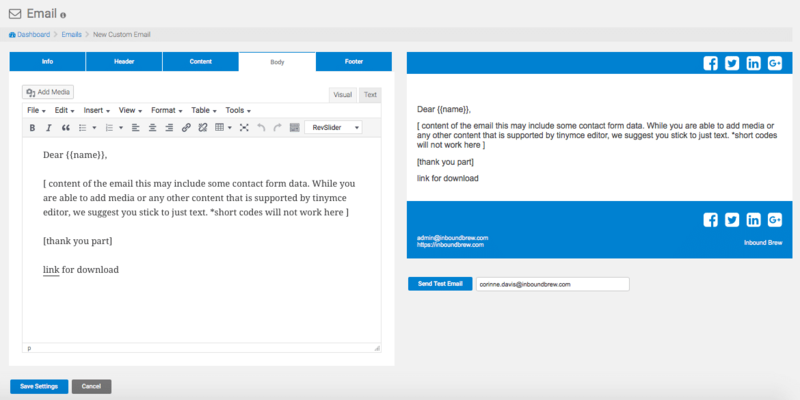 The first tab includes a preset form to get you started on adding content to your email. From here, you will begin constructing your email by assigning a name, subject, to and from field. Next, you will begin to design the email template by selecting options for your custom header, content. email body, and footer. As you design your email, you will see the email preview begin to populate on the right side of the page as you make your selections. You can begin designing your email within the “Header” tab. Here you can customize your email’s header from the padding size, margins, background colors, social media icons, and more. Next, you can customize your email header with a banner image and adjust the spacing and background, and font options for the content portion of your email. The next tab is where you can add content to the body of your email. At the top of the content box is where you will find standard formatting options with options to add media. You can also switch to the “Text” tab to view or input HTML. The last tab is where you can format your email footer. The layout of this tab is similar to the header tab with the same ability to customize the padding size, margins, background colors, social media icons, and more. The last step is to save your email by clicking the blue “Save Settings” button at the bottom left of the screen. Your new custom email template is now ready for use!